Smartphone Nation Confirmed Date For Koodo Mobile BlackBerry Curve 8530? 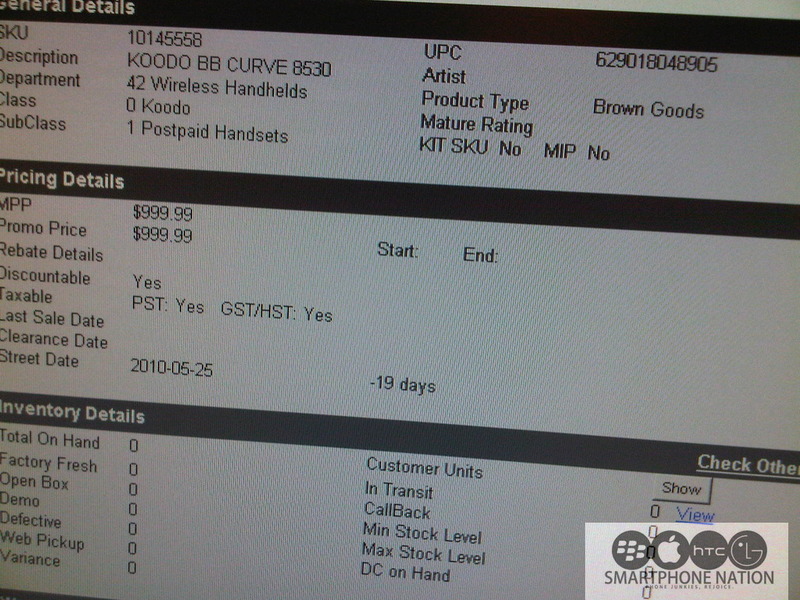 Confirmed Date For Koodo Mobile BlackBerry Curve 8530? It’s been rumored for a while, and earlier Koodo did confirm that the 8530 would be in fact released near the end of May but there was no exact date. An anonymous tipster has sent us a photo of the BlackBerry Curve 8530 showing up on their Future Shop inventory. It lists as $999.99 at a no contract price which we know is not right. But what’s important is the street date (which we have been told is the release date) of the 8530 which is set to release on May 25, 2010. No information on the price plan yet but expect it to be the same as Telus.